Sharing a design I did over at my Stampin' Headquarters. Please click on the photo to see the details of how I made it - including the full supplies list. I've been having a wonderful time creating with stencils. They are perfect for designing cool backgrounds. For this design, I started with the background. I sprayed greens and blues onto the cardstock, then laid a clean piece of cardstock over the color , pressed it down and pulled away to have 2 lovely colored pieces of cardstock. After it dried, I laid the stencil down and spray water over it. I let the water sit on it for about a minute, then dabbed with a paper towel roll. To see more information of this technique, visit Dyan Reaveley's blog and her videos. Next, I stamped the large poppy onto the background and colored with silky acrylic paint (2 coats). I colored the center with a black Spectrum Noir marker. After it dried, I stamped the poppy over the paint with LUXE ink - a lovely rich ink pad created for mixed media. After it dried, I re-colored the center and added a little bling with china black Twinkling H20. I added touches of highlights with a gold metallic Sharpie. To help brighten the center, I added just a little broken china Distress Ink around the edges. This card is special for a special woman that my husband and I know. Sharing some darling little girls ready for Easter Sunday. Jesus is the reason for the season. Images by Mo Manning. Colored with Copics Markers. Wishing you all a Merry Christmas, Happy Kwanzaa, !Feliz Navidad!, Happy Hanukkah and Happy Holidays!!! Jesus is the reason for the season for my family. We are celebrating His birth and celebrating the opportunity to get together and enjoy one and another. Thank you for visiting my blog throughout the year!! I hope you have been inspired!! We are tag hopping today!! We are also having a scavenger hunt!! Here's how it works: visit each blog and look for a letter. When you have all letters, make a sentiment out of them and send your answer to Hetty privately at: buzzy4you@hotmail.com. She will pick a winner on Wednesday the 7th of December. The prize is Michael Strong stamps! If you get lost along the way, go to Hetty's Blog to see the complete list. Here at my blog, you will pick up the letter "P"
Visit Jennifer's blog post next to get continue on the hop and get your next letter! Inked up mini tree image with watermark ink pad and stamped onto white glossy card stock. Repeated five times. 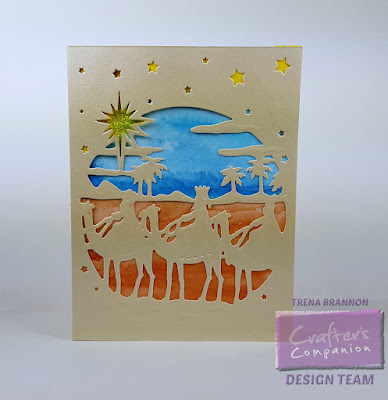 Sprinkled embossing power and heat set. Mask a moon with a circle. Used torn paper to mask hills for snow. I used B23 to air-brush the snow, and B24 to air-brush the sky. Used craft knife to cut small slits in the snow hills. Used glitter pen to add snow. Used stamp positioner to line up sentiment image and stamp. Stamps : Michael Strong, Stampin' Up! Wishing you all a Merry Christmas, Happy Kwanzaa, Happy Hanukkah and Happy Holidays!!! Jesus is the season for me and my family. We are celebrating His birth and celebrating the opportunity to get together and enjoy one and another.